The color of your scarf is really pretty. I’ve made a few of those scarves and I love it because its so easy. Sometimes a mindless project is exactly what you need. I can’t see the second picture for some reason. I wore my one skein scarf today! I made it out of a really soft, purple alpaca/wool blend and it’s one of my favourite scarves. I really like the colour of the yarn you used (but I have nooooo idea what it could be.) 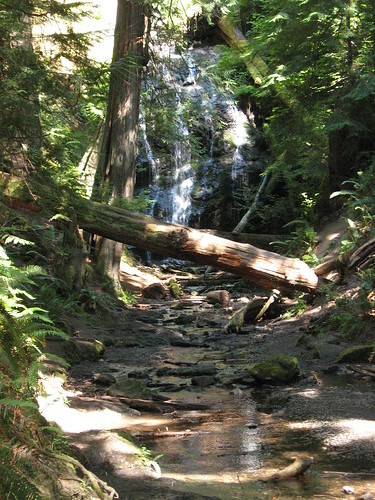 Your photo of the falls is just beautiful ~ I love the dappled light. That is so pretty, I love it! I might have to give that pattern a go myself. 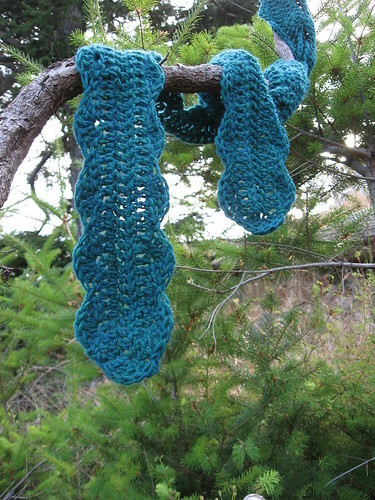 Great scarf — what a cool color. I wonder if it isn’t woolease? I need to learn how to make that scarf! I looooove it!! Where did you get the plug in for the quilty blocks by the comments?? Thats neat-o! I’ve given you a couple of blog awards stop by and check them out. Great color for the scarf. Lovely picture of the falls – looks a really special place! 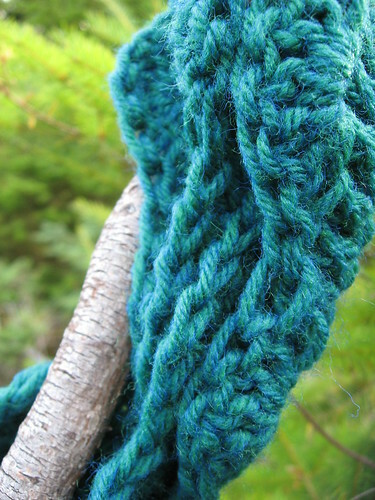 I haven’t ever seen that type of yarn, but it is fantastic! I love the color. The scarf pattern is great, very pretty! And that looks like a great hike, very calming and soothing. Popped over from Ghost’s blog, thought I do some visiting this am. Love the tree pictures, reminds me of a recent trip (pics on my blog) from Muir Woods. Nothing better than a peaceful walk looking at the beauty that surrounds us. Sometimes though, we forget about it in our busy daily lives. The scarf is awesome, I don’t remember that pattern…must get my book out (daughter bought it for me last Christmas), and take a look. Love the color also, no clue though on the type of yarn. Stop in for a visit, welcome mats always out. I love that pic of the tree! It’s absolutely gorgeous. You are one of my award winners for the “I Love Your Blog” award. Please see my blog and save your award button to post on your blog. All the rules are contained there. Stopping in again, wanted to say Congrats on your award. Hope you’ll stop in for a visit. If you have tried to visit my blog and were given a message that it could not be viewed with Internet Explorer, I believe we may have fixed the problem. Please visit me and leave a note if you can get there again to let us know it is now working. I have no idea what happened but I have not blocked anyone from my blog, just a glitch we hope is fixed now. Thank you. love your blog. hope you have time to visit mine. kisses. Long time no see chica! Hope all is well! Hey you! I am finally back from my crazy break. I have finally blogged and crochet again. Hope your doing well and your scarf looks great. Sorry the yarn doesn’t look familiar. Talk some more to ya later! Will you never ever post again??? Качество друзей тоже надо учитывать. Дональд Трамп, например, на двадцатку потянет. You’ve been given an award on my blog: WouldYouLikeYarnWithThat.blogspot.com! Be sure to go check it out!